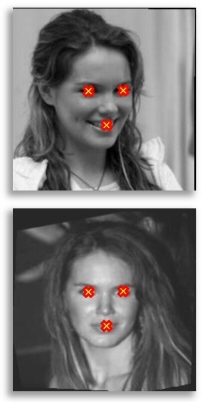 The "Labeled Faces in the Wild-a" image collection is a database of labeled, face images intended for studying Face Recognition in unconstrained images. It contains the same images available in the original Labeled Faces in the Wild data set, however, here we provide them after alignment using a commercial face alignment software. Some of our results, published in [1,2,3], were produced using these images. 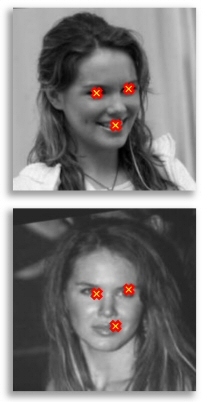 We show this alignment to improve the performance of face recognition algorithms. More information on how these images were aligned may be found in the two papers. We have maintained the same directory structure as in the original LFW data set, and so these images can be used as direct substitutes for those in the original image set. Note, however, that the images available here are grayscale versions of the originals. Two images aligned using the Funneling technique of Huang, Jain, and Learned-Miller (on the left) and the commercial, fiducial-points based alignment system. Misalignments on the left hand pair are visible when comparing the positions of the mouth and the eyes to the markers. These misalignments are all but removed in the right hand pair. Note: The markers shown here are not part of the alignment system, and meant only to demonstrate misalignments.